Vegetarian Rosé Gummy Sweets Recipe that is free of refined sugar, artificial flavours and animal products, unlike the shop bought versions. They are vegan as the seaweed extract agar agar sets the gummy sweets. If you are vegetarian / vegan do check that the wine you use is free of any animal products. Use your favourite rosé wine as the base, you may need to adjust the sweetener depending on the sweetness of the wine. I recommend adding some sweetener as you consume a smaller amount in a gummy sweet so it helps to give a more intense flavour. Use any sweetener you like, we use maple in the video but date syrup, xylitol and agave also work great. These would make a great healthy valentines treat. Especially if you’re back late at night as they are so small and quick to make. I think even lots of the alcohol will be evaporated, but make with fruit juice if you prefer. These healthy jelly sweets look amazing just on their own as the light shines through them. 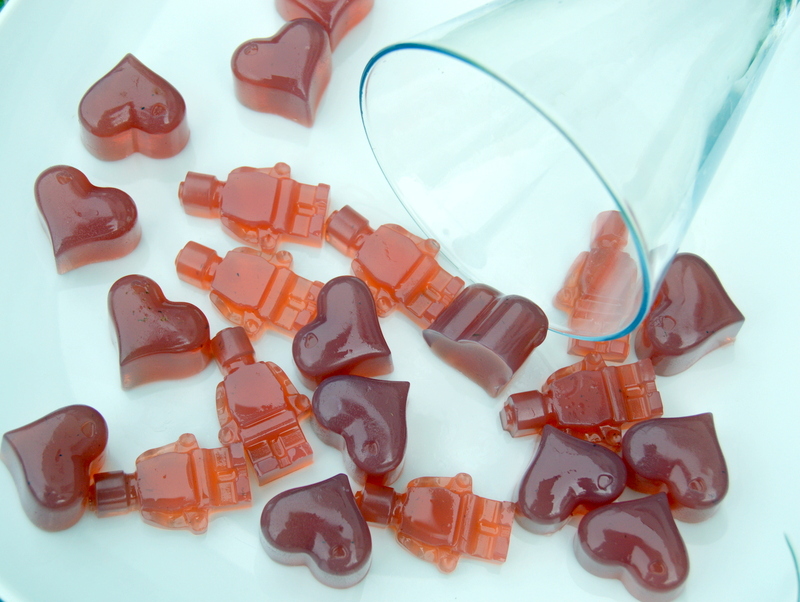 If you don’t have any fancy moulds you can use an ice cube tray like I did for the heart shaped sweets. Did you know Rose wine is made by pressing red grapes and letting the skins sit in the mixture for just a short time? Even if you’re not vegan / vegetarian I would recommend using agar agar and not gelatin as it gives a much better texture, doesn’t have an awful smell when cooking and isn’t sticky. Agar agar can be found in several forms, but for these Jelly sweets I’m using the powdered version and this is the most potent version. If you’re using others, such as agar agar bars, you may need more agar. To test if the mixture will set simply drop some of the mixture onto a cool surface and it should set in 30 seconds. Put your mould into the freezer. Any mould such as chocolate or ice cube works well for this. Mix all the ingredients together in a pan and whisk to dissolve the agar agar. Bring to a simmer while stirring constantly. Simmer for 3 mins and keep stirring to stop any lumps forming. Take off the heat and leave to cool for 5 mins. Pour into the mould and place in the freezer for 10 mins. Shall carry a supply of these sweets around with me……Great!! What a brilliant simple recipe. Is the alcohol all cooked off or are these a fun little adult snack? iS THERE A WAY TO MAKE THESE WHERE YOU DON’T HAVE TO STORE IN FRIDGE? Brilliant recipe! Have you tried making these with other kinds of wine or Champagne? So my jelly’s turned out a little stiff they weren’t jelly at all. I followed the recipe exactly the only thing I did wrong was leave it in the freezer 10 min to long and I simmered for 5 instead of 3. Could this be the reason or was the 1tbsp Agar to much? Agar powder can be a little hard to use bc just a little too much will make it set very stiff. I’ve seen other recipes use only 1-2 tsp of agar-agar powder for 1/2-1 cup of juice or liquid, so try that! Also, agar will not produce the same texture result as gelatin, in case you didn’t know. It’ll have more of a Swedish Fish/Sour Patch Kids type of texture, more chewy rather than squishy.